Inductal 1 mg: Film-coated Tablets: Box of 30. Inductal 2 mg: Film-coated Tablets: Box of 30. Inductal 3 mg: Film-coated Tablets: Box of 30. Inductal 1 mg: Each tablet contains: Eszopiclone: 1 mg. Excipients: pregelatinized corn starch; crospovidone; microcrystalline cellulose; lactose anhydrous DT; magnesium stearate; hydroxypropyl methylcellulose; titanium dioxide; triacetine; FD&C blue N°2 aluminum lake. Inductal 2 mg: Each tablet contains: Eszopiclone: 2 mg. Excipients: pregelatinized corn starch; crospovidone; microcrystalline cellulose; lactose anhydrous DT; magnesium stearate; hydroxypropyl methylcellulose; titanium dioxide; triacetine. Inductal 3 mg: Each tablet contains: Eszopiclone: 3 mg. Excipients: pregelatinized corn starch; crospovidone; microcrystalline cellulose; lactose anhydrous DT; magnesium stearate; hydroxypropyl methylcellulose; titanium dioxide; triacetine; FD&C BLUE N°2 aluminum lake. Eszopiclone is a nonbenzodiazepine hypnotic that is a pyrrolopyrazine derivative of the cyclopyrrolone class with a chemical structure unrelated to benzodiazepines, barbiturates, or other drugs with known hypnotic properties. Its precise mechanism of action is unknown. Its effect is believed to result from its interaction with GABA-receptor complexes at binding domains located close to or allosterically coupled to benzodiazepine receptors. 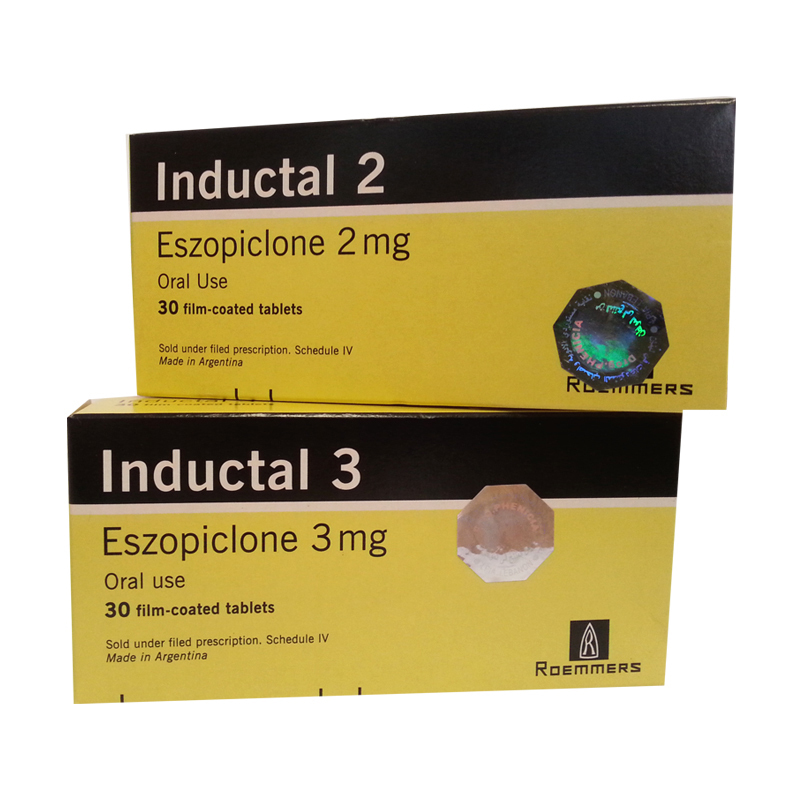 Eszopiclone is rapidly absorbed following oral administration. Peak plasma concentrations are achieved within approximately 1hr after oral administration. High fat-meals may delay the absorption of Eszopiclone and its onset of action. Eszopiclone is weakly bound to plasma protein (~55%). This would indicate a lack of drug interactions due to the lack of competence in protein binding with other drugs. Eszopiclone is extensively metabolized by oxidation and demethylation. The primary plasma metabolites are (S)-zopiclone-N-oxide and (S)-N-desmethyl zopiclone; only the latter compound has certain pharmacologic activity, but substantially lower than Eszopiclone. It was shown that CYP3A4 and CYP2E1, two isoenzymes of cytochrome P450 are involved in the metabolism of Eszopiclone. Eszopiclone did not show any inhibitory potential on CYP450 1A2, 2A6, 2C9, 2C19, 2D6, 2E1 and 3A4 in cryopreserved human hepatocytes. The terminal-phase elimination half-life (t1/2) of Eszopiclone is of approximately 6 hrs. Up to 75% of an oral dose of racemic zopiclone is excreted in the urine, primarily as metabolites. Less than 10% of the orally administered Eszopiclone dose is excreted in the urine as parent drug. Elderly patients had a significant increase in AUC and a slightly prolonged elimination of Eszopiclone. Therefore, in elderly patient lower doses than in young adults are recommended. Exposure was increased in severely hepatically impaired patients. Therefore lower doses are recommended. No dose adjustment is necessary for patients with mild-to-moderate hepatic impairment. No dose adjustment is necessary in patients with renal impairment, since less than 10% of the orally administered Eszopiclone dose is excreted in the urine as parent drug. Inductal is indicated for the treatment of insomnia, to improve sleep latency and sleep maintenance. Known hypersensitivity to Eszopiclone, zopiclone or any other component of the product. Pregnancy and nursing. Because sleep disturbances may be the presenting manifestation of a physical and/or psychiatric disorder, symptomatic treatment of insomnia should be initiated only after a careful evaluation of the patient. The failure of insomnia to remit after 7 to 10 days of treatment, the worsening of insomnia or the emergence of new thinking or behavior abnormalities may indicate the presence of a primary psychiatric and/or medical illness that should be evaluated. Because some of the important adverse effects of Eszopiclone appear to be dose-related, it is important to use the lowest possible effective dose, especially in the elderly. A variety of abnormal thinking and behavior changes have been reported to occur in association with the use of sedative/hypnotics. Some of these changes may be characterized by decreased inhibition (e.g. aggressiveness and extroversion that seem out of character), similar to effects produced by alcohol and other CNS depressants. Other reported behavioral changes have included bizarre behavior, agitation, hallucinations, and depersonalization. Amnesia and other neuropsychiatric symptoms may occur unpredictably. In primarily depressed patients, worsening of depression, including suicidal thinking has been reported in association with the use of sedative/hypnotics. It can rarely be determined with certainty whether a particular instance of the abnormal behaviors listed above are drug-induced, spontaneous in origin, or a result of an underlying psychiatric or physical disorder. Nonetheless, the emergence of any new behavioral sign or symptom of concern requires careful and immediate evaluation. Following rapid dose decrease or abrupt discontinuation of the use of sedative/hypnotics, there have been reports of signs and symptoms similar to those associated with withdrawal from other CNS-depressant drugs. Like with other hypnotics, Eszopiclone has CNS-depressant effects. Because of the rapid onset of action, Eszopiclone should only be ingested immediately prior to going to bed or after the patient has gone to bed and has experienced difficulty falling asleep. Eszopiclone, like other hypnotics, may produce additive CNS-depressant effects when coadministered with other psychotropic medications, anticonvulsants, antihistamines, ethanol, and other drugs that themselves produce CNS depression. Inductal should not be taken with alcohol. Dose adjustment may be necessary when Inductal is administered with other CNS-depressant agents, because of the potentially additive effects. Inductal should be taken immediately before bedtime. Taking a sedative/hypnotic while still up and about may result in short-term memory impairment, hallucinations, impaired coordination, dizziness, and lightheadedness. Impaired motor and/or cognitive performance after repeated exposure or unusual sensitivity to sedative/hypnotic drugs is a concern in the treatment of elderly and/or debilitated patients. The recommended starting dose of Inductal for these patients is 1 mg. Caution is advised, if prescribed to patients with compromised respiratory function. The dose of Inductal should be reduced to 1 mg in patients with severe hepatic impairment. No dose adjustment appears necessary for subjects with mild to moderate hepatic impairment. Also no dose adjustment appears necessary in subjects with any degree of renal impairment, since less than 10% of Eszopiclone is excreted unchanged if the urine. The dose of Inductal should be reduced in patients who are administered potent inhibitors of CYP3A4, such as ketoconazole, while taking Inductal. Downward dose adjustment is also recommended when Inductal is administered with agents having known CNS-depressant effects. While Eszopiclone is a hypnotic agent with a chemical structure unrelated to benzodiazepines, it shares some of the pharmacologic properties of the benzodiazepines. Similar effects were informed in patients with a history of benzodiazepine addiction (amnesia and hallucinations). The clinical trial experience with Inductal revealed no evidence of a serious withdrawal syndrome. Nevertheless, the following adverse events for uncomplicated sedative/hypnotic withdrawal were reported occurring within 48 hrs following treatment discontinuation: Anxiety, abnormal dreams, nausea, and upset stomach. These reported adverse events occurred at an incidence of 2% or less. Use of benzodiazepines and similar agents may lead to physical and psychological dependence. The risk of abuse and dependence increases with the dose and duration of treatment and concomitant use of other psychoactive drugs. The risk is also greater for patients who have a history of alcohol or drug abuse or history of psychiatric disorders. These patients should be under careful surveillance when receiving Inductal or any other hypnotic. Some loss of efficacy to the hypnotic effect of benzodiazepines and benzodiazepine-like agents may develop after repeated use of these drugs for a few weeks. When administering Eszopiclone no development of tolerance to any parameter of sleep measurement was observed over six months. Pediatric use: Safety and effectiveness of Eszopiclone in children below the age of 18 have not been established. Geriatric use: The administration of lower doses is recommended. Ethanol: An additive effect on psychomotor performance was seen with coadministration of Eszopiclone and ethanol for up to 4 hrs after ethanol administration. Olanzapine: A pharmacodynamic interaction was reported; there was no alteration in the pharmacokinetics of either drug. Caution should be exercised. Drugs that inhibit CYP3A4 (ketoconazole): A significant increase in the AUC was reported, together with an increase in the maximum plasma level and the elimination half-life of Eszopiclone when coadministered with ketoconazole, a potent CYP3A4 inhibitor. Other strong inhibitors of CYP3A4 (e.g., itraconazole, clarithromycin, nefazodone, troleandomycin, ritonavir, nelfinavir) would be expected to behave similarly. Drugs that induce CYP3A4 (Rifampicin): Racemic zopiclone exposure was decreased 80% by concomitant use of rifampicin, a potent inducer of CYP3A4. A similar effect would be expected with Eszopiclone. Drugs highly bound to plasma protein: Since Eszopiclone is not highly bound to plasma proteins the disposition of Eszopiclone is not expected to be sensitive to alterations in protein binding nor to other drugs with high protein binding. There are reports indicating lack of interaction with paroxetine, lorazepam, digoxin and warfarin. Patients receiving Eszopiclone should be cautioned against engaging in hazardous occupations requiring complete mental alertness or motor coordination (e.g. operating machinery or driving a motor vehicle) after ingesting the drug, and be cautioned about potential impairment of the performance of such activities on the day following ingestion of Eszopiclone. Pregnancy: There are no adequate and well-controlled studies of Eszopiclone in pregnant women. Inductal should be used during pregnancy only if the potential benefit justifies the potential risk to the fetus. Lactation: It is not known whether Eszopiclone is excreted in human milk. Inductal should not be administered to nursing mothers. Body as a whole: Headache, viral infection, accidental injury, lumbar pain, flu-like syndrome, pain, asthenia, chest pain. Digestive system: Dry mouth, dyspepsia, nausea, vomiting, diarrhea, abdominal pain. Cardiovascular system: Migraine, peripheral edema. Nervous system: Anxiety, confusion, depression, dizziness, hallucinations, libido decreased, nervousness, somnolence, abnormal dreams, neuralgia. Respiratory system: Infection, pharyngitis, rhinitis. Urogenital system: Dysmenorrhea, gynecomastia, urinary tract infection. Unpleasant taste was the adverse event that suggests the clearest dose-response relationship. More rarely (incidence <1%) following adverse events were reported without establishing in each case a clear dose-relationship with the product: Allergic reaction, cellulitis, face edema, fever, halitosis, heart stroke, hernia, malaise, neck rigidity, photosensitivity, hypertension, thrombophlebitis, anorexia, cholelithiasis, increased appetite, melena, mouth ulceration, thirst, ulcerative stomatitis: colitis, dysphagia, gastritis, hepatitis, hepatomegaly, liver damage, stomach ulcer, stomatitis, tongue edema, rectal hemorrhage, anemia, lymphadenopathy, hypercholesterolemia, weight gain, weight loss: dehydration, gout, hyperlipemia, hypokalemia, arthritis, bursitis, joint disorder (mainly swelling, stiffness, and pain), leg cramps, myasthenia, twitching: arthrosis, myopathy, ptosis, agitation, apathy, ataxia, emotional lability, hostility, hypertonia, incoordination, insomnia, memory impairment, neurosis, nystagmus, paresthesia, reflexes decreased, thinking abnormal (mainly difficulty concentrating), vertigo, abnormal gait, euphoria, hyperesthesia, hypokinesia, neuritis, neuropathy, stupor, tremor, asthma, bronchitis, dyspnea, epistaxis, hiccup, laryngitis, acne, alopecia, contact dermatitis, dry skin, eczema, skin discoloration, sweating, urticaria, erythema multiforme, furunculosis, herpes zoster, hirsutism, maculopapular rash, vesiculobullous rash, conjunctivitis, dry eyes, ear pain, otitis externa, otitis media, tinnitus, vestibular disorder, hyperacusis, iritis, mydriasis, photophobia, amenorrhea, breast engorgement, breast enlargement, breast neoplasm, breast pain, cystitis, dysuria, female lactation, hematuria, kidney calculus, kidney pain, mastitis, menorrhagia, metrorrhagia, urinary frequency, urinary incontinence, uterine hemorrhage, vaginal hemorrhage, vaginitis, oliguria, pyelonephritis, urethritis. The dose of Inductal should be individualized. It is recommended not to take Inductal with or immediately after a heavy, high-fat meal since this may result in slower absorption and would be expected to reduce the effect of Inductal on sleep latency. Adults: The recommended starting dose is 2 mg immediately before bedtime. Dosing can be initiated at or raised to 3 mg if clinically indicated, since 3 mg is more effective for sleep maintenance. Elderly: In elderly patients whose primary complaint is difficulty falling asleep the recommended starting dose is 1 mg immediately before bedtime. In these patients, the dose may be increased to 2 mg if clinically indicated. For elderly patients whose primary complaint is difficulty staying asleep, the recommended dose is 2 mg immediately before bedtime. Patients with hepatic impairment: In patients with severe hepatic impairment the recommended starting dose is 1 mg. No dose adjustment is necessary for patients with mild-to-moderate hepatic impairment. Inductal should be used with caution in these patients. Coadministration with CYP3A4 inhibitors: The starting dose of Inductal should not exceed 1 mg in patients coadministered with potent CYP3A4 inhibitors. If needed, the dose can be raised to 2 mg.
One case of overdose with up to 36 mg of Eszopiclone was reported in which the subject fully recovered. Individuals have fully recovered from racemic zopiclone overdoses up to 340 mg. Signs and symptoms of overdose effects can be expected to present as exaggerations of the pharmacological effects, including impairment of consciousness ranging from somnolence to coma. Rare individual instances of fatal outcomes following overdose with racemic zopiclone have been reported, most often associated with overdose with other CNS-depressant agents. General symptomatic and supportive measures should be used along with immediate gastric lavage where appropriate. Intravenous fluids should be administered as needed. Flumazenil may be useful. As in all cases of drug overdose, respiratory and cardiovascular functions and other appropriate signs should be monitored. Hypotension and CNS depression should be monitored and treated by appropriate medical intervention. The value of dialysis in the treatment of overdosage has not been determined. The possibility of multiple drug ingestion should be considered.